Our friendly, professional staff will greet you with a smile and make sure that you enjoy your visit. Relax in our modern and comfortable rooms and ask any questions you need to fully understand what you can expect at your visit. We want to make your first visit as easy as possible. For your convenience you can download our new patient forms from our website and complete them in the comfort of your own home. If you choose not to complete the forms at home, we recommend that you arrive 10 minutes before your scheduled appointment time. We want to partner with you in order to achieve maximum results. During your first visit, our goal is to get to know you and your dental needs. 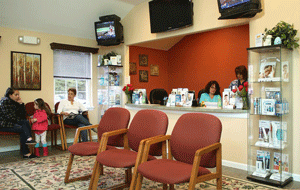 We will also discuss the goals and expectations that we have for your care. This way, you can have the full picture in mind from the very beginning. Next, we’ll get you started with a thorough cleaning with our Hygienist. 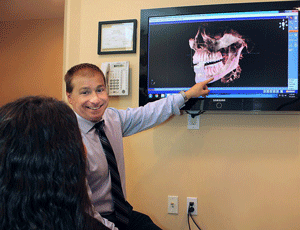 Digital X-Rays: This will help us take a better look at exactly what’s happening with your teeth. Periodontal Evaluation: We’ll check the pockets of your teeth to prevent periodontal disease. Cleaning: We’ll do a thorough cleaning of your teeth and gums to remove any plaque build up, tartar and stains. Once the hygienist’s work is complete, you’ll meet one of our dentists. They will review your X-rays and any dental health needs they find. Together you will determine how to carry out a treatment plan if needed. We understand that different people have different needs. Some who come to see us are in pain, others trust our excellent doctors for a second opinion, and others have been referred to us from other specialists. If the purpose for your visit is not a typical dental check-up, we will work to get you out of pain as quickly as possible and make the most efficient use of your time. Based on the suggestions of your dentist, we’ll make any follow up appointment for additional care. If all went well, you can schedule your six-month visit with our hygienist and we’ll get you on your way.